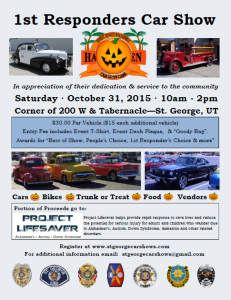 ST. GEORGE — Halloween festivities are starting Saturday at 9:30 a.m. at Town Square Park in St. George with a First Responders Car Show, All Abilities Walk and Halloween carnival. The carnival will run from 9:30 a.m. to 2 p.m. with carnival games, free prizes, food trucks, a band, bounce houses, a prize and opportunity drawing, sensory stations, photo booth and more. The All Abilities Walk will be held at Town Square Park and Main Street in St. George. 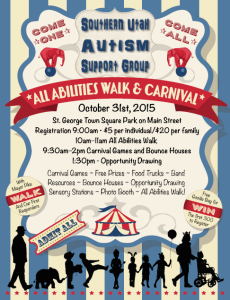 Registration for the walk begins at 9 a.m. and is $5 per person or $20 per family. Goody bags will be given to those who register early. The walk goes from 10-11 a.m. with St. George Mayor John Pike and first responders in tow. First responders participating in the walk, carnival and car show include City of St. George officials, police officers from St. George, Hurricane, Santa Clara, Ivins and LaVerkin, firefighters from St. George, Santa Clara and Ivins, the Washington County Sheriff’s Office, Gold Cross, Life Flight, and units from the 141st and 222nd National Guard. 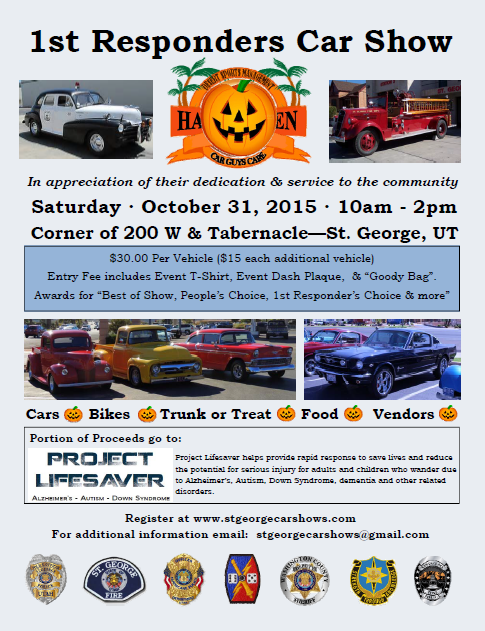 The car show has been created in appreciation of the first responders’ dedication and service to the community. The show goes from 10 a.m. to 2 p.m. at the corner of 200 West and Tabernacle Street. Registration is $30 per vehicle and $15 for each additional vehicle. Entry fee includes a t-shirt, dash plaque and goody bag. Awards will be given for best of show, people’s choice, first responder’s choice and more. At the show will be cars, bikes, trunk-or-treating, food and vendors. Register your car online or contact stgeorgecarshows@gmail.com for more information. When: Oct. 31, 9:30 a.m. to 2 p.m.